If you’ve been to Rajdhani, then you’re familiar with the concept of vegetarian thalis, but you’re still only 50% familiar when it comes to Rasovara!! 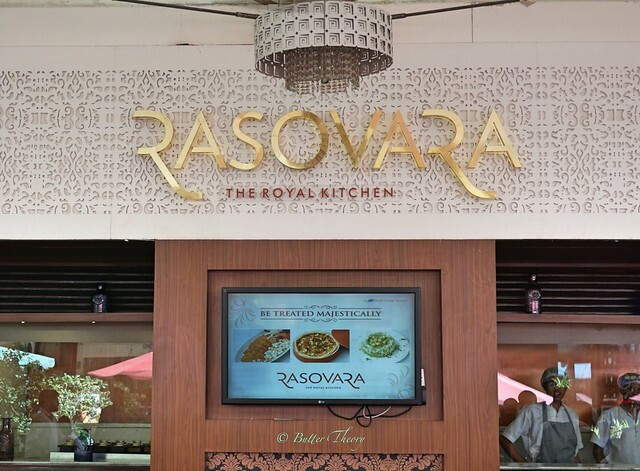 Think big, think a little bit bigger, a bit more , may be a bit more ; that’s Rasovara for you 🙂 Impeccable food & cordial hospitality is what you can expect here. 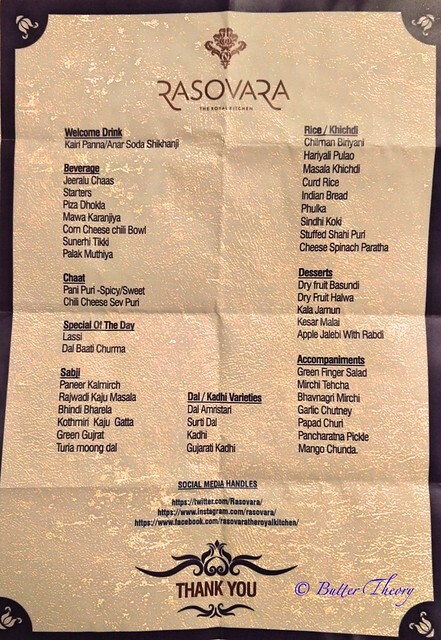 I was at UB city, on a food walk spanning 8 restaurants in 2 days !! This was out pitstop #3 after Fava and Caperberry. We were just in time for lunch and we couldn’t have picked a better time to visit Rasovara! We were greeted by Soumali & Akash ; the Marketing Managers of Mirah Hospitality and the Chef – Maharaj Jodha Ram Choudhary 🙂 The chef was very kind in explaining all the dishes in brief to one and all ! He seemed to have very high patience levels, as some of us were a little caught up with clicking pictures and asked the Chef separately about the dishes, instead of all at once 🙂 . This tends to happen most times as we’re so eager to click pictures! 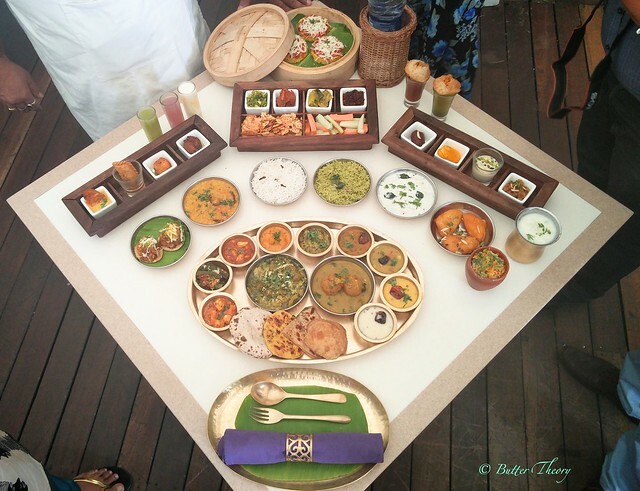 The madness of the Royal Vegetarian Thali began with some Anar Soda Shikanji , Kairi Panna . I quite liked the soda and asked for another shot of this! Yes, both these were served in shot glasses 🙂 They also had mango lassi and masala chaas(buttermilk)! 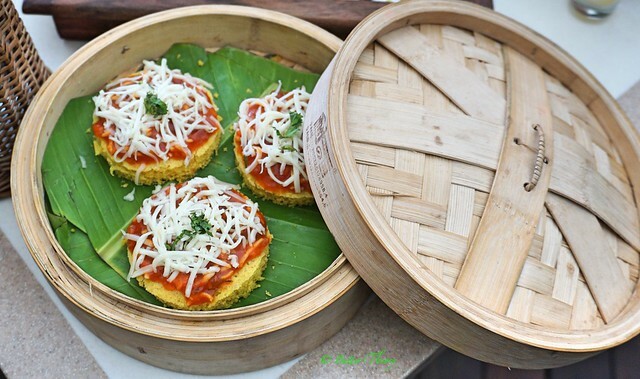 We had a very innovative dish here, called Pizza Dhokla! The pizza had a very soft dhokla base. It was topped with a secret sauce and lots of cheese ! Some of the other appetizers that were good were the Mawa Karanji(deep fried pastry stuffed with a sweet filling of mawa i.e milk solids). We also had Palak Muthia (Spinach Dumplings) , which tasted very good! This is where Rasovara truly shines! 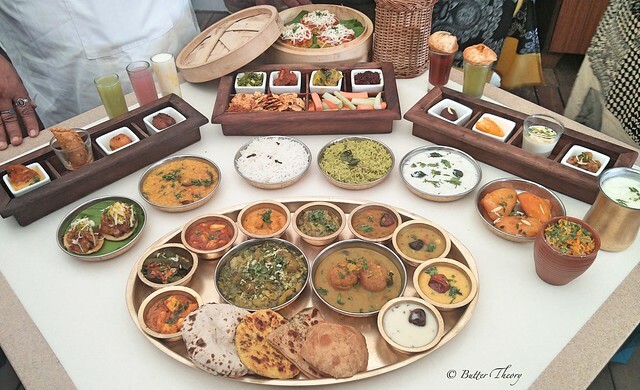 They have a huge spread in the main course and you’d have to have a really good appetite to have all of the dishes! I’d suggest, you pick your favorites and just go with them! Do not take everything 🙂 I repeat – Do not take everything !! I quite liked the 4 different Indian breads(Cheese Spinach Paratha, Phulka, Sindhi koki, Stuffed Shahi Puri ) on offer. Cheese Spinach Paratha being my favorite. Although it could have had a bit more of the spinach in it! The most famous dish from Rajasthan – Dal Baati Churma is something that you must definitely have!! Then there’s the Veg Biriyani and the Shahi pulao if you’re not interested in having Indian breads like myself 🙂 The biriyani comes in a nice little claypot! I also had the Kala Jamoon which I thought was a bit too hard for my liking. There’s also Dry fruit halwa which did taste perfectly right w.r.t the amount of sweetness in it. 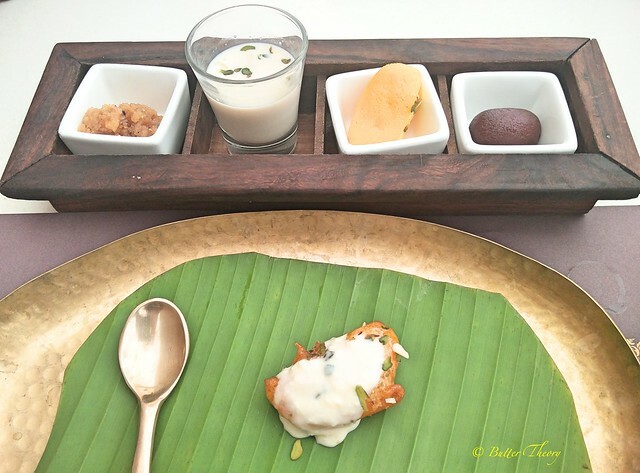 The Dry fruit basundi was too thin and I would have preferred a much richer and thicker version of it! It tasted quite good though! The Kesar Malai resembled a Bengali style dessert called cham cham. It was pretty decent although the filling wasn’t as juicy as it’s bengali counterpart! 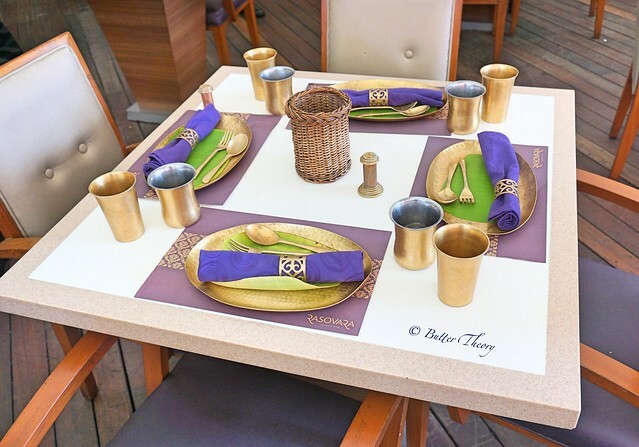 If you’re not willing to pick the humungous thali, you could walk into this place between 3PM-6PM to order A-la-Carte! They do welcome all guests with a chandan teeka( sandalwood ), which has several scientific benefits!! What are you waiting for ? Make a reservation and get down here to truly experience an exotic vegetarian, royal gourmet Indian meal! !